Microsoft Corporation will focus on growing its own advertising and Internet search business after it withdrew its takeover offer for Yahoo, chairman Bill Gates said yesterday. Microsoft has not presented an alternative strategy to compete with its dominant rival in the Internet business, Google, since withdrawing a $47.5 billion bid for Yahoo last weekend. Analysts have been left wondering how the world’s largest software maker will increase its share of that multibillion dollar market without a major tie-up. “We have always felt we could do very well on our own and now that’s the path we are focused on,” Gates said. “The standard strategy for us is to just hire great engineers and surprise people at how well we can compete, even with a company that’s got a strong lead,” he said. Gates says Microsoft remained open to making acquisitions, but declined to comment on possible candidates, such as networking sites like Facebook in which Microsoft already holds a 1.6 per cent stake. “You never know if there’s going to be a deal that makes sense,” he said. Microsoft has developed its own search-ad platform and bought aQuantive, an Internet advertising company, for $6bn, but its US online operations are making loss. It has captured just 10pc of US Internet searches, compared to Google’s 58pc and Yahoo’s 22pc. “We are in software very broadly, but that advertising piece, we think, is a very exciting area,” he said. Gates also said that Bill and Melinda Gates Foundation has donated $3 million for emergency relief efforts in Myanmar and will provide software to help reunite family members separated in the cyclone. Gates was in Indonesia to meet government leaders, including President Susilo Bambang Yudhoyono, at The Government Leaders Forum. 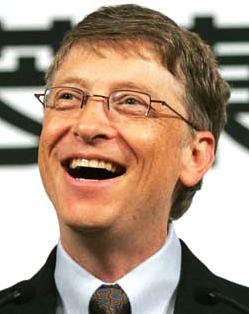 After heading Microsoft for more than three decades, Gates will resign his chairmanship in July. How much bigger is microsoft then google. I would think MSFT could come out with some kind of new graphically enhanced search engine that blows google away. As much as I love google, who seems to be doing everything to blow MSFT away. Which I love.. Competition is Great for the consumer! Let the Fight continue on.